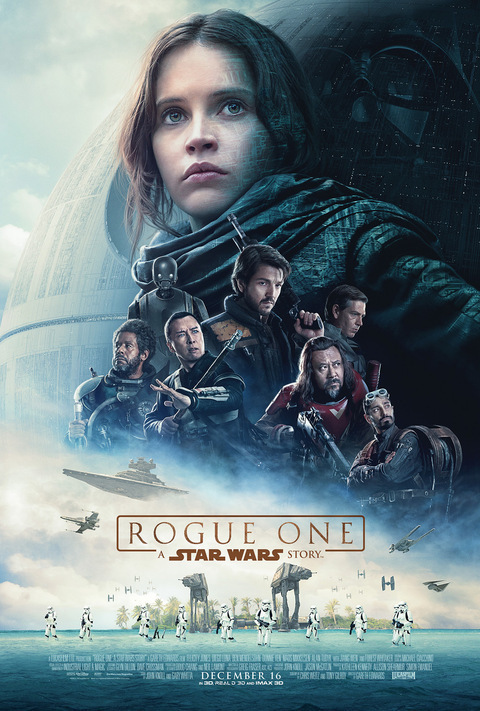 SPOILER WARNING: People are welcome to have an in-depth discussion of Rogue One: A Star Wars Story in the comments on this post. This entry was posted in Pixel Scroll and tagged Rogue One, Star Wars by Mike Glyer. Bookmark the permalink. After Episodes 1,2,&3 I had to learn to let go of my expectations for this franchise. So when I sat down to watch Rogue One on Thursday, I was able to just enjoy it and walked out of the theater with a smile on my face. Oh and Vader going ALL VADER at the end of it, was well worth the price of admission all by itself! Going back for a 2nd helping later this evening. So, I liked it muchly. I don’t think I can say how it stacks up to TFA; they’re deliberately very different movies. I wasn’t expecting “rocks fall everyone dies” to quite that extent at the end. For me, cgi Peter Cushing was just a bit too far into the uncanny valley. I think they needed to have more reflections and side shots rather than using the model in with real actors so much. There were undoubtedly flaws – imperial bad guy who isn’t Vader or Tarkin was a bit forgettable, for example. I wonder if more scenes with him and Hannibal Lecter were originally shot, to flesh them both out a bit better? And I love Forrest Whittaker but I have no idea what his character was about. Slow start, but strong ending. The storm trooper’s armor proved to be even more useless, though. Not only does it not protect from blaster shots, but it doesn’t protect against space tasers or even against a fist to the helmeted-face. We spend a lot of time with Jyn being dragged around by others, but she otherwise has no other motivation. She wasn’t pushing towards anything. She also has nothing to distinguish her from anyone else in the extended universe. Cassian had a mission from minute one and you can tell he’s dedicated to it. Jyn, on the other hand just seemed to move from activity to activity until the midpoint. Not just that, we hear she has done some stuff to get her thrown in prison, but we never get to see it. I wanted to see her pull a heist or something, which would set up something that pays off at the end. On top of this, the Saw Guerrera Thread felt like it got cut short. I felt like Saw and his fanatics were supposed to…help out or something or show up during the last battle in a kamikaze charge but then…nope! We never hear from them again after they appear. Never to be seen or heard from again. You could cut their whole section with no consequence to anything. The section gave us two good characters in Irriut and his friend with the large Blaster, but they are otherwise the whole section could be cut. Not to mention the pilot who spent the whole movie never being allowed to even fly the ship. A good rule of thumb in filmmaking is, “Good material in, good material out.” Give an actor good lines to say and good emotions to convey and they can work wonders. The first half had quite a few lines that fell short. So many really good actors were on screen with nothing interesting to do. First overall the movie had REALLY good spectacle and stylization. There is no shortage of that. Give me more. The second half of the movie from the time they decide to go to Scarif to the last shot is solid gold. A lot of people will give this movie crap for CGI Necromancy, but for me that is a feature not a bug and falls into the, “I’d like to see you do that.” territory. Orson Krennick’s best moments were him going toe to toe with Tarkin and Vader. The movie for me does a really good job of addressing the narrative issue inherent in the premise. That is, it is never in doubt that they will steal the Death Star Plans. The dramatic question is, “How much will it cost?” The answer is full Dirty Dozen. The Vader scenes were wonderful not just in a “They have Vader in the movie!” fashion. Cameos are cheap. Rogue One re-contextualizes Vader’s role in the Empire. He is the Emperor’s Right Hand that only Top Men in the Empire get to meet, let alone talk to. The Death Star literally has been a pet project since the Clone Wars and when it appears on the scene it is out of nowhere. It’s also great in that scene watch Ben Mendolsohn break character as he sheepishly tries to talk to Vader(The story is he had to stop mid-take). It is also great seeing Vader portrayed the way he should be in any media with him: As a slasher movie villain where everyone else is a teenager… If your name isn’t Luke Skywalker, fighting Vader is a fight you will not win. He is a Force of Nature. I also loved how Rogue One stylistically swung for the fences and knocked them down in the process. That ending was ambitious. Unprecedented for a Star Wars movie. Now, no one in the Star Wars universe is safe. That ending also gives new meaning to the “Rogue Squadron” that Luke is a part of in Empire Strikes Back. Implies a lot of potential things. But that’s what I thought of Rogue One. So, the last time I saw a movie that was so obviously two separate movies bolted together slightly uncomfortably was the James Bond movie SPECTRE. And, like that one, neither half is a bad film, but, equally, neither half was sufficient to sustain a movie by itself, so bolting them together sort of works. The production design is fantastic. It reminded me of Argo in the way that it tried to look like it had been made at the time of the originals, and there were lots of little background details to appreciate. And yes, I thought the necromancy worked much better than it should have done; it certainly wouldn’t have made any sense to tell this story without Tarkin. I’m very conflicted about my response to this movie (which I’ll expand on in detail when I get around to posting my review). The diversity of the cast…the female lead…(although not anything at the intersection of “diverse” and “female” alas)…I get why that speaks to people. But the relentless video-game-ism of the plot and visuals makes it clear that I’m Not The Target Audience. If you take away all the shoot ’em up stuff, there isn’t much left. And for me, shoot ’em up stuff is to be endured to get to the good parts of a movie. I didn’t feel the same way about TFA, despite quite a bit of shoot ’em up. When I walked out of this, the first thing that came to mind was that this was what the prequels *could* have been. Self contained to an extent, but with enough bonus bits that build upon the mythos, instead of detracting from it. Also the more significant to worldbuilding – the Force as a religion. The Rebellion as a guerilla/ terrorist alliance (that ambush sequence in Jedha…). The number of planets and locations we see – what, like 8 or 9 separate places. K2-S0, who is probably the relatively well-adjusted child of HK47 and Marvin the Paranoid Android, and who stole almost every scene he was in. And That Vader Sequence. HOMG. Marvel’s been doing wonders (mostly) with their Star Wars comics recently. 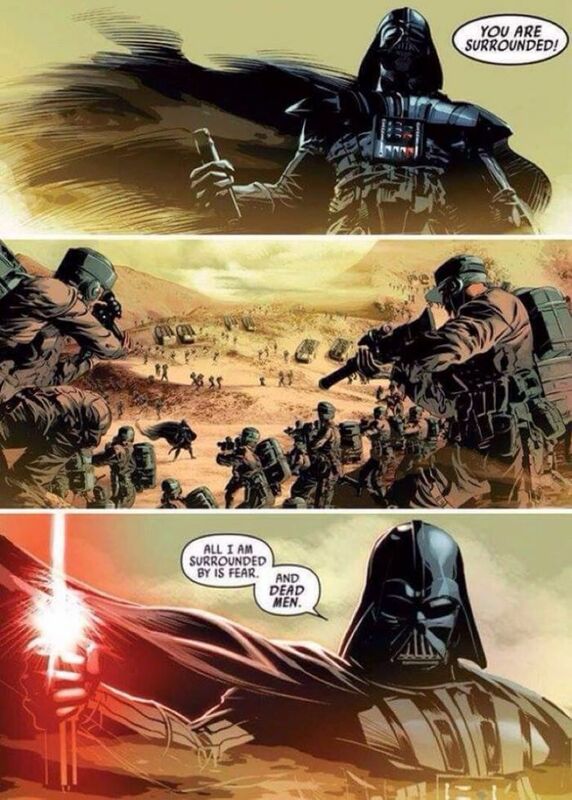 There was sequence earlier this year called Vader Down, where Darth Vader has crashed onto a planet, and the rebels effective dispatch a battalion to take him down. What happens in Rogue One certainly explains why they decided to react in that manner. BtW, Spoiler: It does not end well for them. This may be my favourite Star Wars movie, but a large part of that is because it manages to stand on the shoulder of some pretty great movies. My thoughts – in a nutshell, the Death Star finally gets its due. This was the movie I would have loved to get as a ten year old instead of ANH. I was pleased with just about everything, including the fact that we didn’t get a cameo by a certain Corellian smuggler and his Wookiee copilot. The one thing I’d change, if given the power: I wouldn’t have Princess Leia’s ship literally flying out of the Rebel flagship’s hangar as Darth Vader strides down the accessway. Dramatic, yes, but a little hard to square with all of the “This is a consular ship [choke] we’re on a diplomatic [wheeze] mission” dialogue at the beginning of A New Hope. Also, the timing is a bit squirrelly for how R2 and 3PO get from the surface of Yavin into the ship, which then gets loaded into the other ship, in time to join the Rebel fleet at Scarif. Fair point, but I loved the extreme pace of that sequence and how solidly they connected it to the start of Ep4. I guess we can wave hands and say there was a sequence of time where they tried to pretend they weren’t that ship last seen gunning it away from that battle, it was that other ship that looks just like them guv. @Mark — Yeah, I guess I can accept that. And now we also know why Blue Squadron didn’t participate in the attack on the Death Star. What if the ship that escaped Scarif wasn’t the Tantive IV? It could have gotten out and tansferred it to the Tantive with leia and droids aboard. The timing is also a bit squirrelly for how those two ugly criminal types got off Jedha and into that bar on Tatooine. Yeah, they must’ve been on their way to the spaceport when they bumped into Jyn. Having said which, one way in which I found this movie to be superior to Force Awakens is that it felt like it was written & directed by someone who understood that space is big. Really big. You just won’t believe how vastly, hugely, mind-bogglingly big it is. And that traveling between different points in space actually requires time. It would be a fairly hilarious debriefing. IIRC, the beam was actually so precisely (mis)aimed that it hit the *transmission dish* at an oblique angle, and continued on to wherever else on Scarif. Someone called this the best War movie in the Star Wars movies set. I completely agree with that. We really get to see what an Imperial occupation means. Mos Eisley never felt as under the bootheel as Jedah does. I loved this movie so much. Grim and tragic, minimal jedi, lots of kinetic action, colliding star destroyers. Wow. This might be close to the end for Star Wars movies and me, though I suppose I will have to go see Carrie Fisher one last time. I’m just so *tired* of franchises which have been around for over half my life. Bang, boom, zap zap. I kept looking at my watch. The exhumed Peter Cushing was actually kind of interesting, technically. Maybe 95% of the way to realism? Or did I hallucinate that? I was kinda looking forward to that scene in the movie and it must’ve hit the cutting-room floor…. And I actually kinda liked the “who dies? Everyone dies” ending. Having Our Heroes miraculously escaping would have felt like a cheat. Not your imagination. There’s a YouTube vid around of all the elements from the trailers that went awol – it clearly got quite a heavy re edit at some point. ETA: JJ just ninja’d me so badly there! My understanding is the test audiences didn’t like the original cut. Disney heavily edited and also reshot some scenes. Be interesting to see the Directors Cut someday for compare and contrast. I do wish they had done better at characterization, though. I realize there wasn’t really time for it, especially with that monstrous final battle, but Jyn morphed to stalwart Rebel rather too quickly for me. Also, I get so tired of the token female in a sea of testosterone, even if said female is the lead. There is no story reason why Bodhi Rook couldn’t have been Bodhiya, and Chirrit and Baze couldn’t have been women. (They could still be women of color, obviously. I would also leave Cassian male, because Diego Luna is cuter than a junebug.) The Rebel crowd shots, to my mind, could have and should have been 50 percent female. Yes, yes, I know. I’m never satisfied. But even though this takes place in a “galaxy far far away,” it uses human actors found on THIS planet. And on planet Earth, women make up fifty percent of the population, and our movies should reflect that. Bonnie McDaniel, yes, I was more than a little annoyed while watching the film when I realized that NOT A SINGLE ONE of the volunteers who signed on with Jyn was (apparently) female. (I think there may have been one or two aliens, mind you, but if so, even the aliens read as male to me…) This irritation was ameliorated but not eliminated by the existence of a couple of female rebel X-wing pilots.